People always talk like there’s a bright line between imagination and memory, but there isn’t, at least not for me. I remember what I’ve imagined and imagine what I remember. I imagine this book had to have been one of the hardest to write for author John Green, because much like the main character, 16-year-old Aza, he has Obsessive-Compulsive Disorder. Prior to reading this book, much of what I knew about OCD centered around behaviors I’ve seen on TV and in movies (think Jack Nicholson in “As Good as it Gets” or the clean-freak Monica in “Friends”). 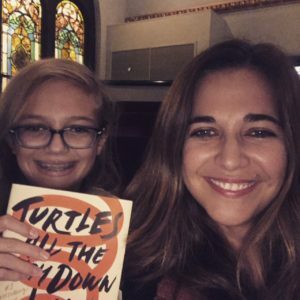 Turtles All the Way Down gives you a first-hand look into the mind of a person with OCD, and how those instrusive thoughts can paralyze us in our everyday lives. Thoughts are just a different type of bacteria, colonizing you. I thought about the gut-brain information axis. Maybe you’re already gone. The prisoners run the jail now. Not a person so much as a swarm. Not a bee, but the hive. This book is a much quicker read than The Fault in Our Stars but I’m not sure it’s any less painful. The characters are well drawn, except I still don’t know what Aza looked like–she never described herself nor did anyone else around her. Daisy is a wonderful comedic sidekick–tough when it’s warranted, zany in her world of Star Wars fan fiction, and forever loyal, even as frustrated as she gets with Aza. Daisy and Aza provide much of the light-hearted banter I remember from Paper Towns and The Fault in Our Stars. I couldn’t help but think of how much this story is the opposite of what most YA books represent. While other books have characters fussing about their parents and wanting distance, Aza and Davis both have voids in their lives in the parental department, and these voids deeply impact them. Green also nails how isolating having a mental illness can be. When you’re in the throes of it, you don’t want to see or talk to anyone else lest you feel the pressure to appear “normal,” but there can also be a deep crushing sadness that hits you when you feel like your “weirdness” and idiosyncrasies keep others away. You remember your first love because they show you, prove to you, that you can love and be loved, that nothing in the world is deserved except for love, that love is both how you become a person, and why. 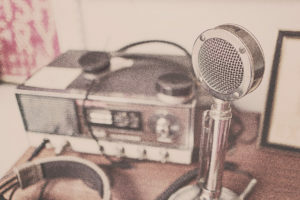 I missed posting for True Crime Wednesday this week due to an ear infection that has slowed me down, but I’ll be sure to report on a new case for that next week. 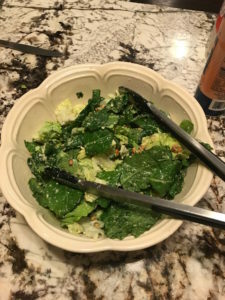 Today I want to talk about a blog I started following this past spring that has helped me revamp my image somewhat, as I was in dire need of a mom makeover. Over the years I’ve struggled with a style identity. In college, I worked at Express, so I looked a lot like the gals on the show “Friends” minus the Rachel hair. Then I went through a bit of a grunge phase (think denim overalls, flannel shirts, combat boots and magenta hair.) I mean, I did go to a liberal arts college. When I first started working professionally I didn’t have a ton of money to my name, so I relied on the sale racks at most of the mall stores like The Gap and New York and Company. A few years later I ventured into Loft and Old Navy territory. After I became a mom and started freelancing from home more, I didn’t know what to wear. I still wanted to look stylish but it was hard to do when you spend your whole day trying to entice your toddlers to eat something besides yogurt and mac and cheese and hoping to hit the gym every once and a while. I went through a phase where I wore nothing but those velour jogging suits, which I finally retired this past year. I actually got excited whenever I had the chance to work on site in an office because it gave me a chance to dress more professionally. Stuck in a rut, I gave Stitch Fix a try for a few months, but I felt like a lot of the clothes I liked were overpriced for the quality, especially blouses, so I stopped after three or four fixes. For example, I loved the blouse below but it shrunk like crazy after one wash and the buttons don’t always stay closed so I have to wear a shirt underneath it so I don’t flash anyone by accident. I was lamenting to a friend and she asked me if I had checked out the Living in Yellow blog. I hadn’t, so I visited the page on Facebook. Blogger Erin Schrader started LIY several years ago while she had a full-time job, but when I started following her she had just decided to take the plunge and leave that position to focus solely on building up LIY. Erin and her team follow sales that happen at many stores I already shop at, such as Loft, Old Navy and Macy’s. The blazer and dress below? Both from Old Navy, courtesy of a LIY suggestion. Cute and affordable! Erin also has a fondness for Nordstrom, and I’ve purchased several pairs of shoes from there in the past few months based on the LIY recommendations. I feel like I’ve stepped up my style game somewhat, and when I got a new job recently, I headed straight to LIY to figure out what kinds of pieces to invest in. I’ve become more schooled in accessories such as jewelry, handbags, shoes and layering pieces like jackets and cardigans, and there are price points suggested for all budgets. 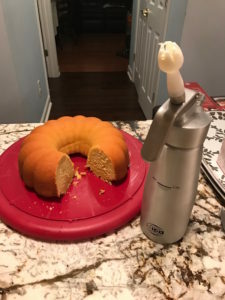 They also mix things up with lifestyle blog posts with tips on home décor, recipes, products for pets, and other fun topics. One of my favorites that also resonated with a lot of LIY followers was this post on Outfits for Fall Family Photos. Yes, please! Erin and team, I love what you’re doing over at Living in Yellow. Now I’m rocking Converses and fun vests and scarves and hopefully not looking as old as I really am. Thanks to your blog I’m finding fashion fun again and even get some great ideas for my 14-year-old daughter, who would live in athletic wear if she had a choice. Erin should be an inspiration to entrepreneurs everywhere (she also has a very talented sister who creates gorgeous farmhouse-style signs at Joyfully Said Signs). So between the two sisters, I’m gonna be broke soon. I can’t wait to spend more time with Erin and Co. this weekend, credit card in hand. Halloween is fast approaching, and along with it is the anniversary of the death of an icon I adored in my teen years, River Phoenix. “Stand By Me” continues to be one of my favorite movies of all time. I knew vaguely of Phoenix’s background–that his parents had been “hippies” and he and his siblings lived in a commune for a while, and he didn’t eat meat. Beyond that, I guess you could say I knew what he and his management allowed the public to know. I do know I was devastated (and shocked) when I learned of his death by drug overdose during my senior year of high school. There was a lot we had no idea about. Times were different in the late 1980s/early 1990s. There weren’t blogs to around to share the dirty little secrets of celebrities, and paparazzi didn’t seem quite as aggressive as they do now. A few months ago I came across a show on the Reelz channel called “Autopsy: The Last Hours of River Phoenix.” I was drawn in immediately. I think what struck me the most was that River didn’t have to die in the early morning hours of Oct. 31, 1993 at the Viper Room in Hollywood. By all accounts he had been clean during the filming of his last movie, “Dark Blood,” and decided to let loose that night. He had marijuana, valium, cocaine, and pseudoephedrine in his system (he was nursing a bad cold). He went to the Viper Room in the hopes of jamming on stage with Johnny Depp and Flea from the Red Hot Chili Peppers. The stage was too crowded and they couldn’t let him perform. Even though he wasn’t consuming alcohol that night, at some point he ingested a speedball (mixture of cocaine and heroine) in a liquid form. It was too much for his body to handle. Even though the nearest hospital was only a mile away, the group he was with didn’t want anyone to know he was on drugs, so they sat with him as he more violently ill. No one called 911 until he started seizing, and by the time the paramedics reached the club it was too late. One of the people interview for the Reelz program was Gavin Edwards, author of Last Night at the Viper Room: River Phoenix and the Hollywood He Left Behind. I immediately sought out the book. Edwards is a contributing editor for Rolling Stone and has also written for Details, Spin, and the New York Times Magazine. The book follows the life of Phoenix (born River Jude Bottom), from his humble early beginnings living with the questionable Children of God cult (which encouraged free love, even among young children) to his family’s decision to have their children seek fame and fortune in Hollywood. I love how the book is structured–it reads like one long magazine article, featuring interviews from actors/directors Phoenix worked and pulling from previous media interviews. I learned so much reading this book, and it was heartbreaking. Phoenix never had a proper education, and he had trouble relating to kids his own age because he had not spent a lot of time with them in normal social settings. He most likely had dyslexia. His first love was music. He desperately wanted to be a musician, but acting did a better job of paying the bills. His work supported his entire family–he was the breadwinner. Although he talked about being “anti-drugs” in media interviews (he was also a devout vegan), he was first exposed to drug and alcohol use in his preteens on various movie sets. 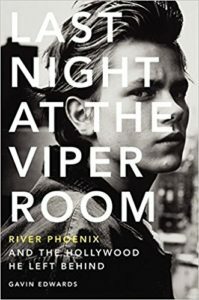 The other thing I found interesting about Last Night at the Viper Roomwas how the author also wove in a timeline of other up and coming young actors in Hollywood (Johnny Depp, Leonardo DiCaprio, Tom Cruise, Brad Pitt, etc.) and what was happening in their careers as Phoenix’s career progressed. For a pop culture junkie such as myself, this was just a bonus. If he had been given medical attention earlier in the evening of Oct. 30, Phoenix might not have died that night. But with the downward spiral he was on, we can’t really say if he would have lived any longer. Reading this book helped me understand how such a talented young actor could have become overwhelmed and led down the path he ended up on. I couldn’t put this book down until I finished it, and then my heart hurt for a very long time afterward. This is a case that drives home the fact that you can be vulnerable anywhere, even in the early hours of the morning when you’re doing something as innocent as trying to get to work. This case has always bothered me, because when 27-year-old news anchor Jodi Huisentruit disappeared, she wasn’t out partying or returning home from a late night with friends. She had overslept and was in a rush to get to her job at news station KIMT in Mason City, Iowa, where she hosted the early morning show. Jodi was an ambitious reporter who was focused and working hard on advancing her career. Her friends and co-workers described her as vivacious, friendly, motivated and energetic. On the morning of June 27, 1995, Jodi didn’t show up for her 4 a.m. call, and a co-worker phoned her from the station to check on her. According to the co-worker, Jodi was awakened by the phone and said she would “be right there.” She only lived a few minutes from that station. But based on the evidence that was found a few hours later by police when Jodi didn’t show up for work, she never made it out of the parking lot. Jodi’s car was still there with they key bent in the lock on the driver’s side door. Tools she needed for work (a blow dryer, jewelry, shoes, etc.) were found scattered the ground. Drag marks near the car suggested a struggle, and that Jodi was most likely ambushed while she tried to get in her car. Neighbors later reported they heard screams in the early hours of the morning but no one called the police at that time. Someone else claimed to have seen a white van in the parking lot with its lights on around that same time. 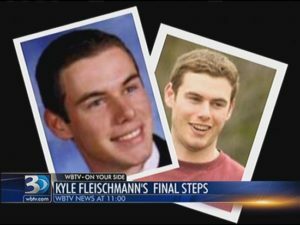 The “Disappeared” episode on this case provided a lot of interesting information. The really eerie thing? Jodi’s employer, KIMT, had to report on their missing anchor, so it hit her co-workers hard. Watching news footage during that time, you can see how shell-shocked they are. Female anchors were also nervous because they were afraid there was a stalker out there who had known what time Jodi left for work each day and would strike again. There was another person of interest brought up during that episode. Jodi had a friend, an older gentleman who had wanted a relationship with her, but she had gently told him she wasn’t interested. He had lavished her with attention and gifts and even threw her a birthday party. After her disappearance, he went to the police and told them he was “the last person to see Jodi alive,” which was kind of bizarre, because no one knew if Jodi was deceased. 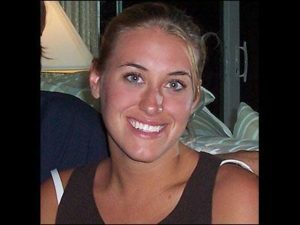 In 2011, a female police officer fired from the Mason City Police Department claimed that three members of the department had been personally involved in Jodi’s disappearance and had covered it up. This officer also filed a sexual harassment suit against the department and claimed to have been discriminated against based on her religion. Because she had a contentious relationship with the department, it’s hard to know if there is any truth to her claims, but you do have to wonder if she was fired for knowing too much. There has never been any closure in this case, and Jodi was declared legally dead in 2001. Ben knows my story, Ben knows my soul. I want him to write for that, to that, to me. Because when he taps into me, and I braid myself to him, we are a galaxy unto and of ourselves. Sometimes she’s like a firework, explosive but still mesmerizing, and it’s not like I don’t want to sit back and watch the show. I like author Allison Winn Scotch for a number of reasons—her books are always fun and fast-paced escapes, often with a touch of the mystical (The One That I Want, Time of My Life) and tackle the popular topics of “What if?” I enjoyed her last novel, In Twenty Years, where a group of college friends reunite after twenty years (think “The Big Chill” in a modern-day setting). She’s also a funny presence on social media, having first started out as a freelance journalist for big-name magazines like InStyle, Redbook, Shape, etc. (my dream job!) before becoming a best-selling author. When I heard about her latest book, Between Me and You, and how its plot centers on an actress and a screenwriter and their complicated relationship, I knew it was for me, the gal who has piles of celebrity gossip magazines around her house at any given moment. (In Touch and UsWeekly are my favorites.) 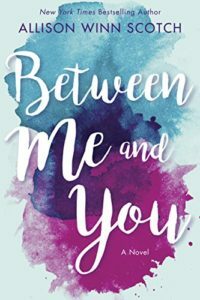 I was lucky enough to get an advance digital copy of Between Me and You to read and review and I dove right in. The book starts out in the present day, when Ben and Tatum are in their early 40s and have been separated for some time. Ben is waiting for Tatum on the beach, reliving their history together in his mind, but then someone else shows up instead. From there the book alternates chapters telling both Tatum and Ben’s stories. Tatum’s chapters propel the narrative forward (1999 to present) while Ben’s work backward (2016 back down to 1999). We learn how they met by chance in a bar in 1999, when Tatum was a theater student and part-time bartender and Ben working on an MFA. He was also in the process of breaking up with his long-term girlfriend when he meets Tatum. Through the years, we watch as both of their stars rise after their move from New York to Los Angeles, like the quintessential Hollywood couple. The relationship of Brad Pitt and Angelina came to mind (Tatum goes from struggling actress to Oscar winner to influential director throughout the course of the book, much like Angelina) as well as Jennifer Garner and Ben Affleck (this one because of the infidelity that invades the marriage and because Tatum is from a small town much like Garner). 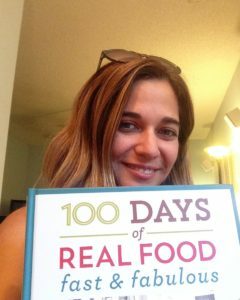 I did read an article not long ago that said she interviewed several different celebrity couples while researching this book to help provide authenticity, and she thanked Jennifer Garner and Judy Greer in the acknowledgements section. Throughout the book, Ben and Tatum face their share of challenges, from the death of Tatum’s mother, to her alcoholic father, to a loved one lost in 9/11 and a family member with a heartbreaking drug addiction. They also have a son and struggle with the balance of parenthood while Tatum is often away filming or directing and Ben gets frustrated with his job of writing for TV when he really wants to be writing the screenplay that will put him on the map. The chapters kept me guessing, as each one dropped crumbs of the story along the way. I found myself rooting for Tatum and Ben and also cursing them for the foolish decisions they made and refused to communicate with one another. I was on the edge of my seat by the time I got to the end. I will say that if you are going to read this book, don’t read it on a Kindle like I did. Because of the way the chapters alternate time periods, I found myself wanting to quickly flip back and forth to double-check information, and that’s not easy to do on a digital device. So read this in the print version and you will feel much less frustrated. Thank you to NetGalley and Scotch’s publicity team for allowing me the opportunity to read this book in advance, I enjoyed it and will read it again now that I have a better handle on the way the timeline worked, I’m sure I can pick up on even more tidbits the second time around! Because I like to write young adult fiction, I also read a lot of it, too. I’m not crazy about dystopian literature or fantasy titles and gravitate more toward contemporary topics. I think this is what drew me to novelist John Green several years ago. I started hearing people talk about how great The Fault in Our Stars was, and then I saw it had been optioned for a movie. It was then that I picked up the book and starting reading the tale of Hazel Grace (cancer patient) and Augustus (cancer survivor). I cried for hours after finishing it and loved the movie just as much. From there I read Looking for Alaska, which I believe has been banned from some schools. If you’re like me, if something is banned from a school, I definitely want to read it! From there I went on to An Abundance of Katherines, which was a great concept but I couldn’t really get into it. Then I heard Paper Towns was being made into a movie with scenes shot in the city I live in, so I read it next. I knew Green had been busy for several years working on the development of two films, which was exciting. Every author’s dream, right? But what I didn’t know was that he was also suffering from a case of writer’s block trying to produce his follow-up to The Fault in the Stars. 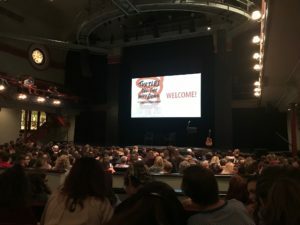 I got to hear the backstory last night at the “Turtles All the Way Down with John and Hank Green” event last night here in Charlotte, N.C. I feel fortunate that I even heard about the event. I happened to be scrolling through Facebook one day and saw Green post a tour schedule with the comment, “I’ve been told these events might sell out quickly.” I clicked on the schedule, saw Charlotte on it, and immediately went to buy tickets. 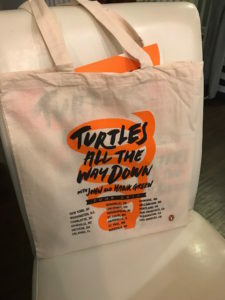 I was also shocked when I saw the ticket price of $21 included a signed copy of his new book, Turtles All the Way Down. Talk about a deal! (The event did indeed sell out quickly.) The tour includes John and his brother Hank, who I have to admit is very lovable. Together, they join forces to produce the popular YouTube channel, Vlogbrothers. First of all, the venue was beautiful. The theater at Spirit Square was intimate, with red upholstered seats and stained glass windows surrounding us. There wasn’t a bad seat in the house, which was good because our tickets were general admission. We chose a seat in the middle and had no problem seeing. Spirit Square in Charlotte, N.C. The evening started with us receiving swag tote bags that listed the 19 cities on this tour (I feel special), our signed copies of the book, a booklet with some letters from John Green, a bookmark, a cardboard poster of the tour, and some post-its. The event lasted an hour and a half, and time flew by. I can hardly wait to dig into Green’s new novel, which is already getting rave reviews from some of the major media outlets. Tonight, John and Hank are headed to Asheville to the UNC-Asheville, my old alma mater, and I’m sure they will be just as well received. Hearing John’s personal story, learning about the book, and joining the cause to fight against the stigma of mental illness also made me itching to get back in front of my computer to write. Thank you, John and Hank, for a fun and inspired evening.